Windows OS Hub / Exchange / How to Import and Export Mailbox to PST in Exchange 2016/2013/2010? In the Exchange Server 2010 SP1 (and newer), special PowerShell cmdlets appeared: New-MailboxImportRequest and New-MailboxExportRequest that allow you to import or export the contents of the Exchange mailbox from / to PST file. In the previous Exchange versions, to import/export data from Exchange to PST file you had to use third party utilities (most often, the ExMerge utility was used). In Exchange 2016, 2013 and Office 365, the Exchange development team continued to develop Exchange cmdlets for importing / exporting to PST files, slightly expanding the functionality and increasing their performance. In this article, we’ll cover typical examples of import/export data from Exchange mailboxes to personal folders files (PST). where fr_exchange_admin – is the name of the account that gains the “Mailbox Import Export” role permissions. 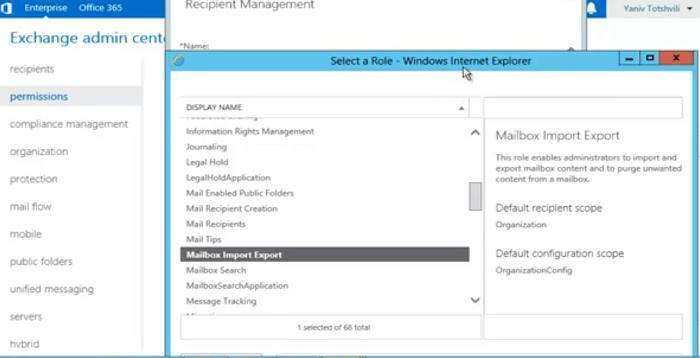 The same can be dome from the EAC (Exchange Admin Center) graphic interface by assigning the Mailbox Import Export to the desired user or group. After granting RBAC permissions, restart the EAC or Management Shell console. The user performing the import operation must have the NTFS read permission on the network folder with the PST mail archive file. Use the following command to import the content of a PST file from a shared folder into the user’s mailbox usertest. When importing into the target box, the contents of existing folders are merged, and new folders are added to the existing mail folder structure. New-MailboxImportRequest -Mailbox usetest -FilePath \\HQ-FS01\PST\usetest.pst -TargetRootFolder "Old_mail" -IncludeFolders "#Inbox#"
If the user mailbox size exceeds the specified limit. Let’s consider a more complex task: suppose, you have to export all emails received after January, 1, 2019, that contain keywords “Project” and “London”. You can also export items only from a specific folder with a search mailbox search results, obtained using the Search-Mailbox cmdlet. When exporting the user mailbox to a PST file, the user mailbox contents on the Exchange server are not cleared. Great solution to export Exchange 2013 data into PST format by using PowerShell commands, and also to importing PST file data into exchange 2013. But sometime import PST file, and export Exchange file data to PST with the help of PowerShell cmdlet is difficult to non-technical users, and the process is also lengthy. So in this situation user can try other solution like converter tool edb.2pst to extract, export exchange mailbox to PST format.